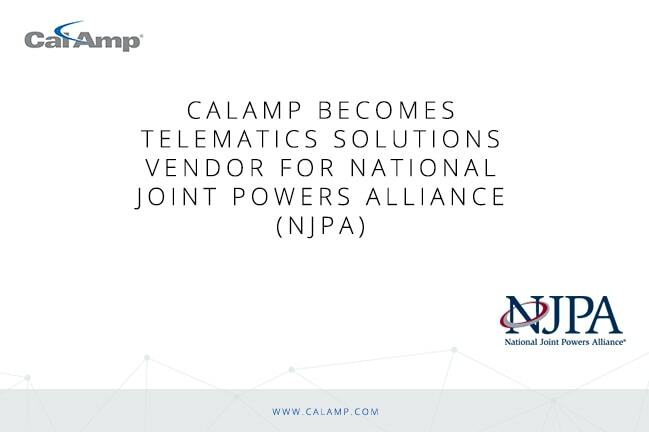 CalAmp was recently awarded a contract by the National Joint Powers Alliance® (NJPA) for Fleet Management and Related Technology Solutions. This agreement will allow NJPA members to easily purchase new CalAmp solutions or update their current ones. We are proud to be included in this select group of vendors. NJPA is a cooperative purchasing contract for local governments which leverages the purchasing power on a national scale for its 50,000 member agencies while streamlining the purchasing process for them. The new contract was effective on June 1, 2017 under contract number 022217-CAW. CalAmp’s GovOutlook™ has been assisting government fleets for over ten years. This AVL system is fully integrated with Esri GIS and designed to protect valuable assets, cut costs and improve fleet productivity. By providing a complete, real-time view of vehicles and mobile resources, local governments are able to more efficiently provide public works and other services such as snow plowing and solid waste collection. Optimized for mixed ﬂeet management, GovOutlook was developed to meet diverse tracking and management requirements of municipal agencies. In addition, NJPA members have access to CalAmp’s FleetOutlook® and AssetOutlook™ for mixed fleets. All three CalAmp solutions integrate with third-party applications so counties and cities have access to the latest information for work orders, dispatch, GIS and routing systems. The one-way or bidirectional data communication allows for complete fleet visibility to support improved productivity and efficiency. CalAmp’s solutions were designed for modern fleets and smart cities. For more information about NJPA, visit their website. And learn more about CalAmp’s telematics solutions for government fleets here.